Scott Hanselman demonstrates a non-trivial model binder in his post “Splitting DateTime – Unit Testing ASP.NET MVC Custom Model Binders”. One detail I want to call out about Scott’s DateTime splitter is how you still don’t need to use Request.Form when building the model. Inside the GetA<T> method you’ll see how Scott uses the binding context’s ValueProvider property to fetch data. The ValueProvider represents an amalgamation of all data from the request’s posted form values, routing data, and query string. Scott’s example is great, but it is missing one detail – the propagation of binding errors. I'm pelased all your recipe names must start with "bacon"
Thanks for the awesome post. I'm new to MVC, and learning more every day. I wasn't exposed to model binding until reading NerdDinner, but I plan on using model binding on my next project. Thanks for the eye opening post! 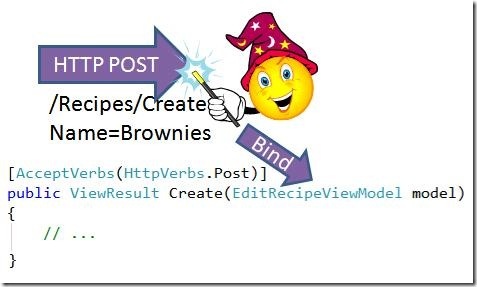 As I pointed out in my post (http://tinyurl.com/ozpavk), I think one of the most important steps in model binding in MVC is to use View Models as opposed to directly binding to entities. I love the light weight off the MVC with still alot of power comparing to the heavy duty page model. I've noticed that while I can override by model with the ModelBinderAttr, but the default model type is invoked for things like arrays of your models. What is the best way to override the ModelBinder for arrays? Steve: I believe this changes in 2.0, and I'll have to try it out myself. I know if you register the model binder at app startup instead of using an attribute you can have the custom model binder invoked for each element in the array. Very useful information but, at least for me, quite difficult to implement. I failed the first attempt. I didn't manage to do it are there any similar tips in an other article? Great summary on model binding and thanks for the perfect resources. Great post, Tip #3 is my favorite method why reinvent the wheel? I've written a whole post on creating a Custom Model Binder by inheriting from DefaultModelBinder. Thanks for the information you provided. It would be great if got more post like this. Very interesting! hi. check my post of asp.net MVC cons and pros.